Gran Torino, Sammo Hung style. The legendary kung fu star returns to direct his first film in almost 20 years. He also takes the lead with an authentic, understated performance in an otherwise confused action comedy. There is a gentleness to the film which is quite becoming, albeit disturbed by moments of brutality. Sammo relishes the opportunity to linger on every bone-breaking take-down in x-ray detail, and there are some quite grisly knife attacks. But it’s the knockabout comedy moments which jar the most, coupled with a redundant narration which adds nothing. Sammo is brilliant as the pitied, aged figure of Old Ding, a former state bodyguard who is shown in a doctored photograph to have been part of China’s state security during Nixon’s famous visit in 1972. Ding is now a lonely, retired, “hard-headed fat old man” with worsening dementia, living a small town existence near the Russian-Chinese border and haunted by the loss of his granddaughter. He soon becomes something of a surrogate grandfather to another girl; the daughter of his neighbour Andy Lau (who also acts as the film’s producer). Lau plays a self-serving scumbag in an ill-fitted jacket who steals a stash of jewelry from some Russian thugs in a bid to escape gambling debts, and soon the local gangsters are pounding on his door. Old Ding, who is referred to as ‘Kung Fu Panda’ by the hoods, eventually steps forward to protect the girl when the baddies step in. Sammo’s one-man-army routine at the end is a barnstorming event, and proves he has not lost any of his ability to orchestrate edgy, innovative combat sequences. He creates a palpable balance between Old Ding’s martial arts superiority and his frailty. 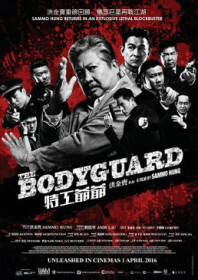 A roster of knowing cameos add to the film’s lightness: Yuen Biao as a friendly cop, Yuen Wah as a postman, and filmmakers Tsui Hark, Karl Maka and Dean Shek who play a trio of grumpy old men. Everyone seems to be growing old disgracefully, which is nice to see. Like a lot of Sammo’s work, this is tonally ambiguous, but also unashamedly crowd-pleasing.